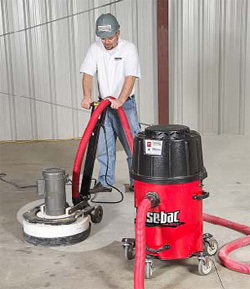 For many contractors, a shop or industrial vacuum may be an afterthought. At the very least, you may not put a whole lot of time into choosing the vacuum that specifically fits your company's needs. After all, the expectations you probably have for your vacuum are pretty simple: It should pick up dust and debris, and it should last a reasonably long time without requiring a lot of fussing. According to Bryon (Bru) Bruington, technical sales director at Kut-Rite Manufacturing Co., that mindset is a mistake. "Contractors should put as much thought into choosing and maintaining their vacuum as they do into their grinders or diamond-blade saws," he says. "A common misconception is that bigger is better. Contractors should consider their company profile (what type of work they typically perform), the ease with which the vacuum will accommodate their usual job, the efficiency of a vacuum, the maintenance required to keep the vacuum in top working order and, of course, cost." A large-diameter hose might suit the needs of a flooring contractor but be too cumbersome for the more detailed work of a countertop specialist, Bruington notes. "Or perhaps the type of work you typically do requires a vacuum that can handle a lot of rolling around. In that case you should pay attention to the strength and durability of the casters." Choosing a filter is also a consideration. Jobs that fall under EPA rules for either asbestos or lead paint abatement require that contractors be certified and use a high-efficiency particulate air (HEPA) filter. While HEPA filters are the cleanest available, they can be cost-prohibitive for contractors who are not required to use them. 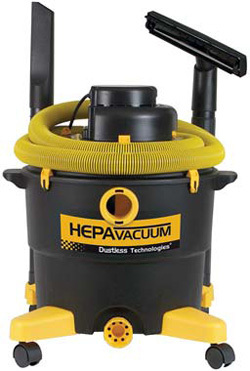 HEPA filters aside, most manufacturers offer a variety of filters for their vacuums. 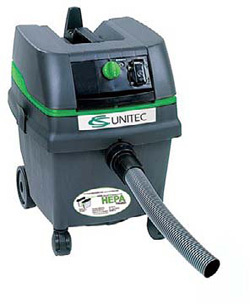 HEPA or not, filters tend to get clogged by fine dust, reducing the efficiency of a vacuum. Many manufacturers offer a choice between manual and self-cleaning options. Most manual cleaning systems feature a type of push rod, allowing the operator to agitate the filter by pushing the rod, thereby knocking the dust off. 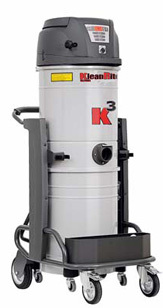 Self-cleaners generally work in one of two ways - utilizing the vacuum exhaust system to agitate the filter or requiring attachment to a compressor. "It's important to consider the man-hour ramifications when choosing between a self-cleaning and a manual-cleaning vacuum, " says Chris Hudson, president of Pathfinder Concepts LLC. "If your jobs generally require a lot of vacuuming, your crew may spend a lot of time manually agitating the filter. In that case a self-agitator probably makes sense. On the other hand, if a vacuum is only needed sporadically, the less expensive manual systems may be more appropriate." "Whatever features a contractor chooses, it's important to remember that concrete dust is abrasive. It's hard and aggressive on the innards of a vacuum, " says Bruington. "Today's vacuums are precise operating systems. They need to be maintained like any other high-end tool. A little maintenance can go a long way - clean the filter regularly, replace the filter when it wears out, and spend some time cleaning the mechanical parts." The Cyclonic Debris Management System reduces filter exposure to debris. Three twist-off HEPA-rated spun-bond polyester filters last 10 times longer than conventional filters. Certified to eliminate 99.97 percent of dust particles that are at least 0.3 micron in size, as per federal HEPA guidelines. Sturdy wide-stance dolly for easy, stable maneuverability. All metal parts are galvanized or powder-coated to withstand the harshest environments. Equipped with a Tank Capacity Sensor (TCS) that provides visual and audible warnings when the tank reaches capacity. A tool-to-hose adapter to easily connect portable power tools such as grinders and saws. A Power Take Off outlet, which activates the on/off switch from the power tool switch. A 10-second shut-off delay to clean out any dust left in the hose following power-tool shutdown. An automatic shut-off sensor protects the motor and filters during wet vacuuming. The Electromagnetic Pulse Filter Cleaning System shakes HEPA filters to remove dust, maximizing suction and doubling filter life. 15 feet of hose and 25 feet of power cord. Compact design, making it easy to maneuver. 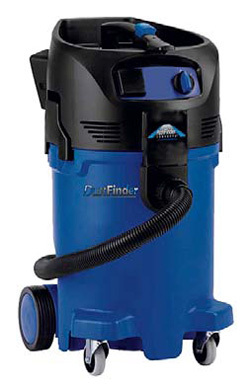 Easily replaceable cartridge filters with a fully automatic self-cleaning system. An overload relief valve to protect the compressor. 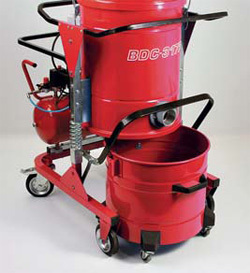 Virtually dust-free operation for following small shotblasters and medium-sized grinders and polishers. Detachable dustbin with easy debris disposal. Approved for hazardous materials such as lead and asbestos, whereas many other HEPA vacuums are only recommended for allergens. The HEPA filter is certified to ensure minimum filtration efficiency of 99.97 percent of dust particles at 0.3 microns. Certified to meet airtight standards so as to not compromise the performance of the filter. Disposable Micro Pre-Filter greatly extends the life of the HEPA filter by capturing everything but the smallest particles. Baffle wall inside the canister keeps water from reaching the HEPA filter. Holds up to 40 pounds of dirt and debris. Hilti AirBoost filter technology for consistent high-suction performance. Very good handling thanks to compact design. Full exploitation of tank capacity due to placement of filter and hose connection in the upper part of the machine. Robust housing to withstand the harshest job-site conditions. New tank concept for easy and virtually dust-free dust removal. 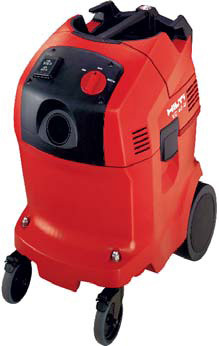 Maximum total load of dust: up to 40 kilograms. 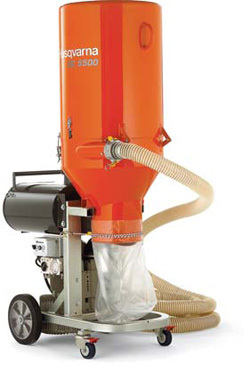 A three-way filtering system for efficient containment of dust. Particle filtration rate of 99.9 percent of dust particles at 1 micron. A unique bag-disposal system that contains messy and hazardous substances. Electronic keypad with LED indicators that monitor the performance of the main and HEPA filters. Manual filter shaker to quickly clean the main filter. Oversized handle for easy push or pull. Accessory storage tray and cable holder. Liquid and solid sensors that automatically shut off the machine when maximum capacity is achieved. The DustFinder DF31Z answers the need of fast, dependable and continuous dust collection. Designed with patent pending "reverse blast " filter-cleaning technology, the DustFinder system keeps the filter clear of debris in order to maintain constant cubic feet per minute. High-efficiency spun-bond polyester filters with patented Ultra-Web technology. Ergonomic cart with large caster wheels.